If there ever was a time for zoodles, it’s now. I might have had just onnnnne cupcake too many this weekend and, wait – now that I’m 33 am I too old to say zoodles? It is just so super fun to say. It’s made my entire week already and it’s only Monday. Unfortunately, it’s probably also time to stop saying “super” so much? Noooooo. This recipe comes from my friend Ali’s book, Inspiralized. 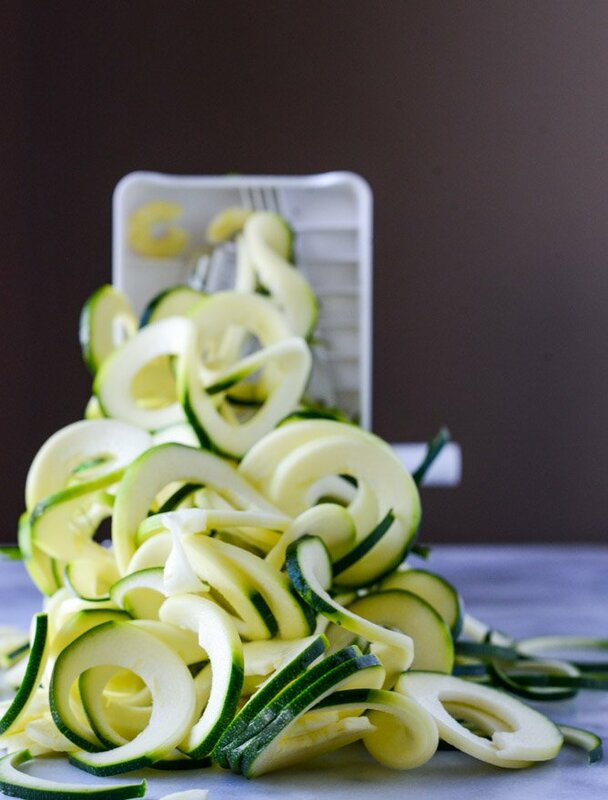 Everything is… spiralized! I am actually blown away by the things she spiralizes. She makes hamburger buns out of spiralized veggies. WHAAAAT. And, even cooler. She made her own spiralizer. Like, what? It is so insanely inspiring. How can I create a fun product like this?! Maybe a bacon fryer? A peanut butter grinder? Never did I ever try spiralizing something (shocker) until now. It wasn’t a trend I succumbed to, which is crazy since I’m a marketer’s dream. And being that I’ve never been veggies’ biggest fan, I wasn’t exactly thrilled by the idea of turning everything in a veggie noodle. But now. I am hooked. Like HOOKED. Ali wins. Big. The noodles can be made four different ways (um, hello curly fries…) and since I am a child and need to trick MYSELF into eating veggies, this has pretty much turned into the best thing ever to enter my life. Ever ever ever. They actually LOOK LIKE NOODLES. So it was pretty easy for me to love this dish with multiple reasons behind the loving. First, I adore anything and all things Thai. I gravitate towards flavors like this nearly as much as I do with mexican food. Second! I’ve never been a pasta freak. Pasta isn’t my THING, you know like how bacon or pizza or chocolate covered peanut butter spoons are my thing. I enjoy pasta in many ways but it’s never my first choice when it comes to cooking dinner. So I wasn’t missing the texture of traditional linguine or anything like that. 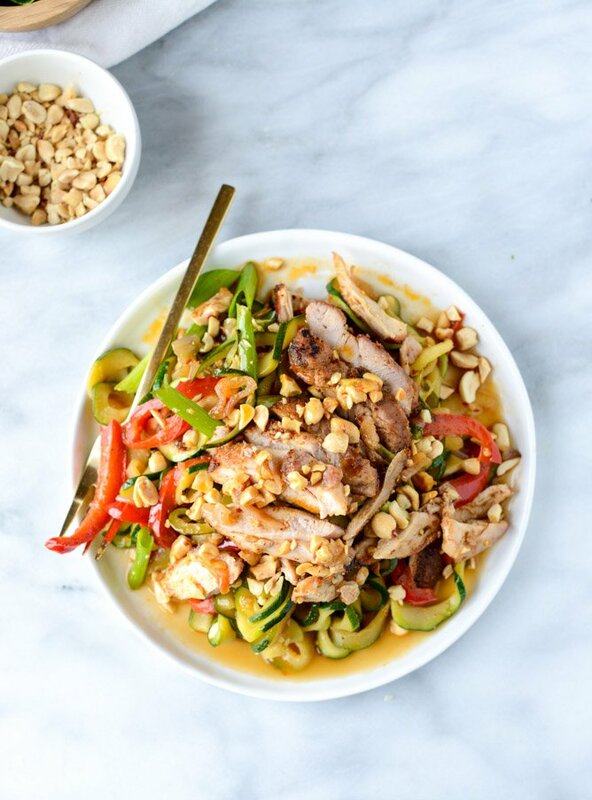 And third, there is so much texture in this dish with the honey chicken and the crunchy peanuts. The recipe in Ali’s book calls for ground pork, but I had chicken on hand and went with it. Seriously cannot even WAIT to try it with the pork though. Soooo. I’d say this is a pretty good start for doing things how I want to be doing them at 33. Waaaahoooo. Heat a large skillet over medium heat. Once hot, add the hoisin, soy sauce, oyster and sweet chili sauce and stir it together. Cook for 1 to 2 minutes, until the sauce is combined and warm. Transfer it to a bowl. Add the coconut oil to the same skillet over medium heat. Season the chicken with the salt and pepper. Add it to the skillet and cook until browned on all sides, about 6 to 8 minutes. Stir together the chili garlic sauce (or sriracha) and honey and add it to the chicken. Stir well and cook for another minute or two. Transfer the chicken to a bowl or plate. Add the shallots, garlic and red pepper to the skillet. Cook until softened, about 5 minutes. Return the sauce and the chicken to the skillet. Cook for 1 to 2 minutes. Add in the scallions and the zucchini, tossing well to coat. 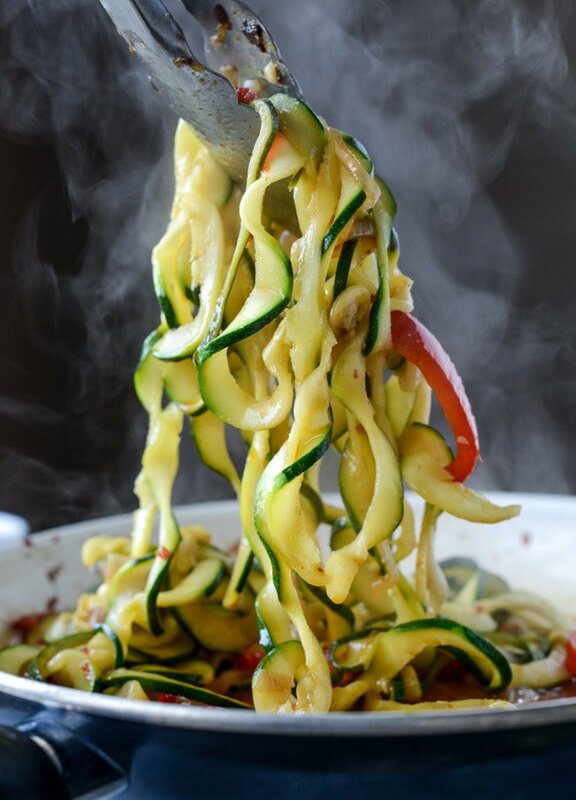 Cook for 2 to 3 minutes, until the zucchini noodles soften. Toss in the peanuts. 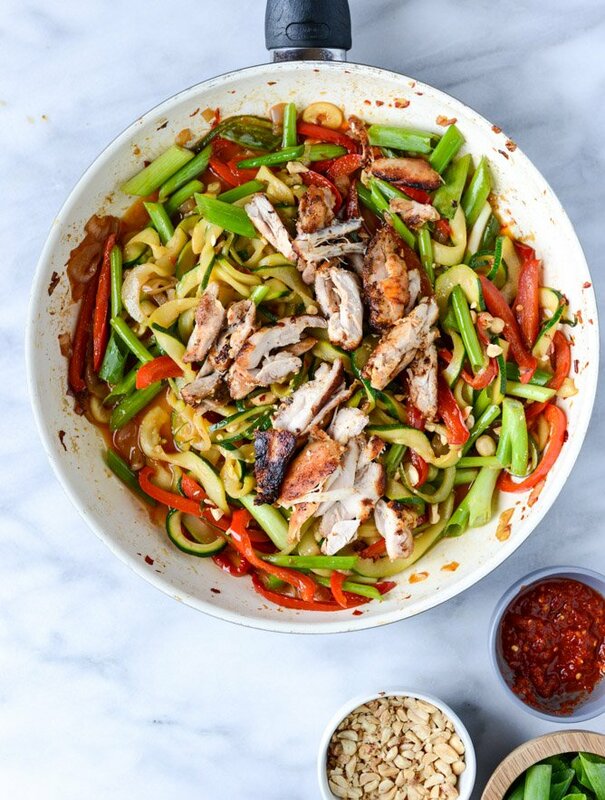 Drizzle the entire skillet with hot chili sesame oil. Serve immediately. Sephora VIB Sale: What I’m Loving. Just made this. ❤️❤️❤️❤️❤️ I wanted to drink the sauce. The chicken was so good! Wish there were leftovers! Making again – stat! Gahhhh! I made this tonight and it was SO good. The sauce was amazing and I didn’t even miss the pasta. Truth is, I don’t eat a lot of pasta. I might order it when we go out, but I rarely make it at home. This probably tasted even better than actual pasta to me because it didn’t leave me with that heavy feeling in the pit of my stomach afterwards. I will DEFINITELY be making these again. New fave! I tried this recipe and added in Sereno and habanero peppers since I like my food VERY spicy. It’s probably the tastiest dish I’ve ever cooked! Can’t wait to try another one of you recipes! Thank you for sharing! Delicious recipe and easy to make! We loved the flavor combination and also the leftovers :-). Thanks for the recipe! Sriraccha not mentioned in ingrefients, and a pp ears in instructions??? I hate w h en recipess are publipublshed like this. You can’t figure out that it’s the same as the chili garlic sauce? It’s mentioned in the instructions. Maybe you should still with grilled cheese. That’s cheese and bread just in case you need some help. Are you typing from another dimension? Fell in love with this recipe this summer (just the photo) and finally made it tonight. It is the only thing that made me want a spiralizer and so I got one! So delicious! Another tasty thing to do with zucchini is also always appreciated. Made this last night – VERY delicious and easy! With new recipes I usually double the sauce because I have a tendency to dry out the chicken while I do it the first time. Didn’t need to. Too much leftover sauce and what the recipe calls for is perfect. Question: If I totally forgot to get coconut oil can I just use olive oil as a substitute? I used simple vegetable oil, and it turned out very tasty. Looks so delicious cannot wait yo try it. All my favourites here. Num mum! Made this a few nights ago and it was SO good. Definitely a keeper. I didn’t have a spiralizer so just slivered the zucchini into long noodles. Thanks so much for a perfect dinner! The flavor in this dish was absolutely divine! My husband went crazy! This is a “10” and will be requested again very soon. Thank you! SO good! We substituted shrimp for the chicken and my picky son even ate it! GREAT DISH! AMAZING! This was my very first spiralized recipe and it turned out fantastic. I actually have the Inspiraiized book by Ali, but it has many ingredients that I find either hard to get or too fancy for my house. I’m sure her recipes are phenomenal and I will try them, I love this adaptation as it uses “normal” ingredients for my house. Please note that “normal” is 100% relative to each persons own home. OMG! This was so good! I wanted to lick my plate. I am not easily impressed and find a lot of recipes just aren’t that great. This one is a keeper! We ate it all and plan to make it again next week! It’s very hard to find a flavorful, health dish but this one delivers! Thank you! So delicious. My hubby loved it too. Will definitely make again. I made this for dinner last night after fawning at the recipe for months. I made it with tofu instead of chicken, it was INCREDIBLE! I cannot wait to make it again! This recipe is delicious! We loved it and it came together so quickly! 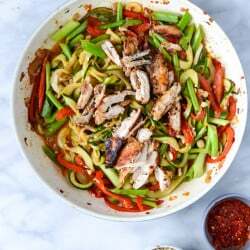 This recipe looks great but it was advertised as low carb; where is the nutrition info? I won’t make anything with no nutrition info. Please advise.